How Do You Make Seafood Gumbo? Granny Boutte answers the question how do you make seafood gumbo. 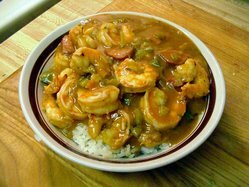 She has gumbo recipes that are sure to please the discriminating palate! She has tips to reduce the calories and time saving hints. What is gumbo? It is a spicy dish that is a cross between soup and stew. The name is synonymous with Cajun cooking! It is perhaps the most famous of all New Orleans dishes. There are many variations of this tasty dish. The 2 distinct versions are differentiated by the type of broth or stock. Okra gumbo is thickened with okra. Okra was originally transported to America by African slaves. File gumbo requires a roux base and has a thinner consistency. File is dried sassafras leaves originally discovered by the Choctaw Indians of Louisiana. Roux is a flour/butter thickening agent. Shown is a bowl of shrimp gumbo. The ingredients may vary but all gumbo is served over rice! You'll love Granny Boutte's recipes! This recipe is healthier than traditional okra recipes. Not as messy either! Want good luck? Try Gumbo zHerbes on New Years! This recipe contains shrimp, crabs and oysters. If you like seafood, this gumbo has it all! Want a gumbo alternative? A delicious shrimp and crab chowder is the answer!